Founded in 1948, the brand Talika, known as the institution of the eyelash growth, was taken over in 1994 by Alexis de Brosses, who enlarged the company’s field of expertise on all eye care. Beyond the simple cosmetology, Talika continues its journey of excellence by creating instrumental cosmetics that can be used at home through Light Therapy. Focus with Prestige. You are an eye care specialist. Why did you choose this domain? It is actually the field of eye care that has chosen us, related to the origin of the brand! Talika was born in 1948. Danielle Roches, an ophthalmologist, formulated a healing herbal cream to heal the eyes of war wounded, who had the side effect of promoting lash growth. She then created Talika, focusing on the beauty and growth of the eyelashes and eyebrows. Since 1994, when I took over the company, I enlarged its field of expertise on all eye care. The look is the most interesting area to study because the most expressive in the face, the most lively, the most strategic field of expression. From a scientific point of view, the skin of the eye contour is the finest, the most fragile, the most mobile, where all the best cosmetic expertise can be expressed. What is the added value that Talika brings to the woman? Every woman has in her the potential to be sublime. Talika’s goal is to help her reach her maximum genetic potential through a specific approach to transmit the vital energy of the living world to each of her skin cells. We create solutions naturally boosting the energy and the original functions of the cells. 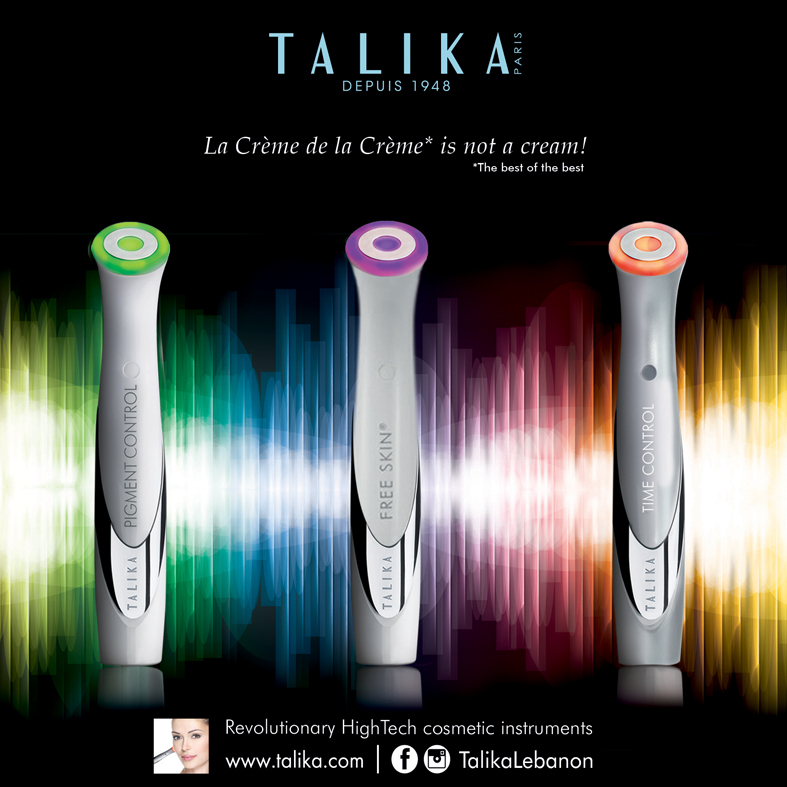 Talika goes through real innovations, always clinically proven, with absolute respect for the skin. How did you come to innovation? Our philosophy is «explore, discover, transmit». We know how to explore the world. We draw inspiration from scientific discoveries, ancestral knowledge and we transmit them to the Woman with our beauty treatments. Behind every product Talika hides a unique creation process and a true story, born of a meeting between Man and Nature. Ayurvedic medicine, Nasa research, beauty rituals of Egyptian queens, techniques of healing of burnt people are all sources of inspiration giving birth to a Talika care. Tell us about instrumental cosmetics … Light therapy, ionotherapy, ultrasound is an avant-garde field reserved for cosmetic surgeries and dermatologists. They are top-of-the-range, state-of-the-art technologies that are accurate and effective, but are reserved for medical use. At Talika, we have adapted the instrumental cosmetics to home use, so that everyone benefits from its effectiveness. Talika devices are powerful, compact, nomadic, practical, easy to use and secure. An investment for many years. What about Light Therapy? Light is the source of all life, pure, renewable, ecological. To understand Light Therapy, one must imagine visible light as a sum of wavelengths. Each wavelength corresponding to one color and the sum of these colors, which sweeps all the colors of the rainbow, corresponds to the white light. Nasa’s work has shown that some luminous colors have healing medical healing powers, anti-inflammatory … Talika was inspired by this work to specifically address cosmetic issues: orange light is anti-wrinkle and firming, green light anti-staining and lightening, blue light antibacterial and sebo-regulating. Talika is a pioneer and world leader in this technology.